See official website for a map of the course. 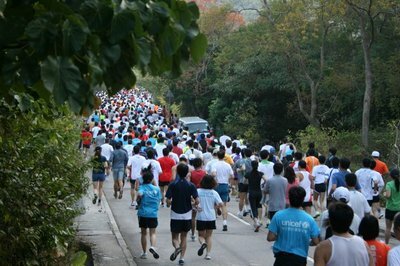 Runners lined up in Tsukuba Central Park, with six-time-winner Ritsumeikan University from Kyoto the favourite. A group of runners reached the first hand-off after 5k, with Ritsumeikan's Risa Takenaka a close second to Kyoto Sangyo University's Itoh, who finished in 16:06. Frank-Arnaud Mehl was the one bright spot on an otherwise underperforming Namban team, finishing the 10k in a PB of 38:18. An out-of-shape Mutsumi ran 48:24, Juergen was happy with a 39:41, not too bad after recovering from a long-lasting cold. Completed the Hong Kong 15 Km Challenge race ( 香港15公里挑戰賽2008 ] in a moderate slow time of 1 hr 23 mins+ in the slightly cool morning today. Renard Gregoire meets Tokyo's most waterproof running club! On Dec. 17., in heavy rain, Namban Rengo as usually had the biggest group on an otherwise almost deserted track. One reason may have been Renard's presence, as he had moved to South Africa a few months ago and was just back for one track work-out! Good to see you again, Renard! 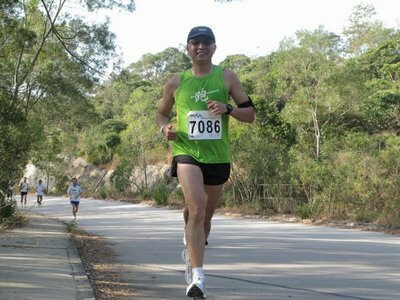 I wore my new Adizero CS for the first time to join my first Mizuno Shek Mun 10 K Race ( 美津濃第二屆石門 10公里賽 ) in the early morning today. I finally managed to complete the race in an easy pace of 48 mins+ which was already quite a good time to me. 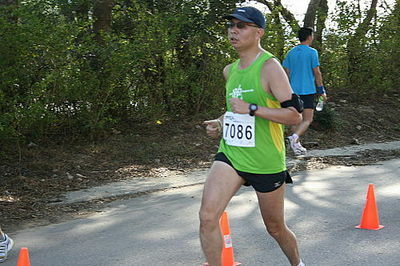 I run Naha Marathon in Okinawa on 7th Dec.
entry. Last Sunday was a good sunny day. Nice weather for marathon. My finish time was 2:53:16. I think it was good time for me. Because,the course was very tough. It was not easy to run by even pace. It was almost flat by 10km point. 10km to 20km was going up to 90m. I took part in Kwaguchi marathon .it was one of big race in Saitama.I tried to break 19' 00". the first prize out of 300 women. I was very happy to get a gold trophy!! 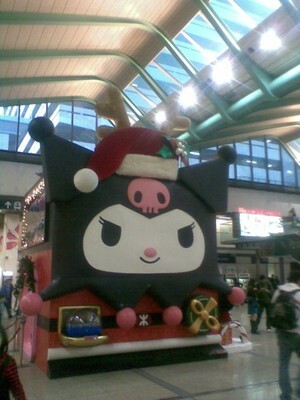 The annual Fukuoka Marathon was held as usual on the first Sunday in December. Conditions were favourable and commentators were hoping for a fast race. A group of Japanese and international runners, mostly invitational, went through the 5k in 15:07.